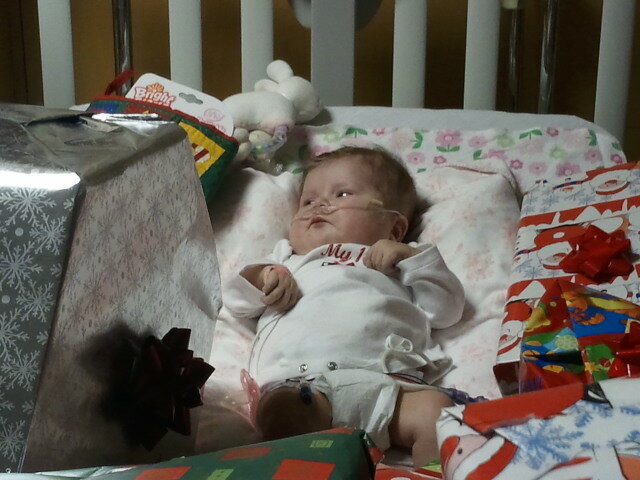 I write this from Annabelle’s hospital room… my heart taking a long look back on Christmas 2010. The first thing you might notice is that… we are still in Annabelle’s hospital room. We were not able to come home for Christmas. To say the least, the last two days have been emotional for us all. We’d planned to bring our Annabelle home for the first time on Christmas Eve. The doctor’s had all agreed. Scott went to work on Thursday night, then went home to do the final touches on the house so it would be “ready.” We finally put together her swing, something, for some reason, I’d been unwilling to have done before now. He made sure her room was straightened up and ready for her, got her carseat and stroller in the van, and hung up her welcome home signs/balloons all over our front yard. We were beyond excited and so totally ready to welcome our little one! He got to the hospital around 1 a.m., and Annabelle was fussy, which is abnormal for her at that time. Then, at 4, the nurse came in and took her temperature. UGH! She got her some tylenol, took blood cultures, and the whole time I knew what was happening. God was saying no. I got up and held my baby and rocked her. I sang songs to her, but could barely finish any of them because I would start bawling. Part of me was convicted. Another large part of me was devestated. And I just couldn’t reconcile the two parts. I was convicted because I think, to a little bit of a point, I’d changed what Christmas was about this year. Instead of focusing on celebrating the birth of Jesus, I was celebrating Annabelle coming home. I’d made it more about her than about Jesus. Maybe that sounds like a harsh judgment, but that’s the little prodding at my heart that I felt. Talked to the doctor, and she said if the fever came back down quickly and stayed gone all day and night, she could potentially go home on Christmas day. I promptly shewed away my guilty feelings and latched onto this new news. I’d asked God to let Annabelle be home for CHRISTMAS… not necessarily Christmas EVE. Now, funny story here. That morning, I decided to take a shower. (I know, craziness huh, ha!) A nice hot shower always helps for my ultra-emotional moments. So I hopped in the shower in Annabelle’s bathroom… and let the hot water drown out my frustrations. I was turning off the water when I heard a beating on the door. I opened the shower curtain to see two inches of standing water completely covering the bathroom floor. My clothes were on said floor… and were soaked. On top of that, all my dirty clothes had been in a pile on the floor as well… and were soaked. And considering the dryer downstairs has been broken for over a week and I hadn’t done laundry in a while… yeah. The only thing I had dry was a pair of very thin capri jammie pants, and a pair of Scott’s sweatpants. And they were in Annabelle’s room. So I stood there, no clothes on (sorry for the horrible visual), feet deep in water, and just laughed. I mean really. What else is there to do??? Scott got me my last pair of pants and handed it to me through the door. I quickly dressed and came out to see that half of Annabelle’s room had been covered in water as well… Scott had laid sheets and a billion towels all over. Since it was freezing out, I changed into Scott’s sweatpants (a nice sight there too) and we picked up our kids from my sister and told them the bad news. 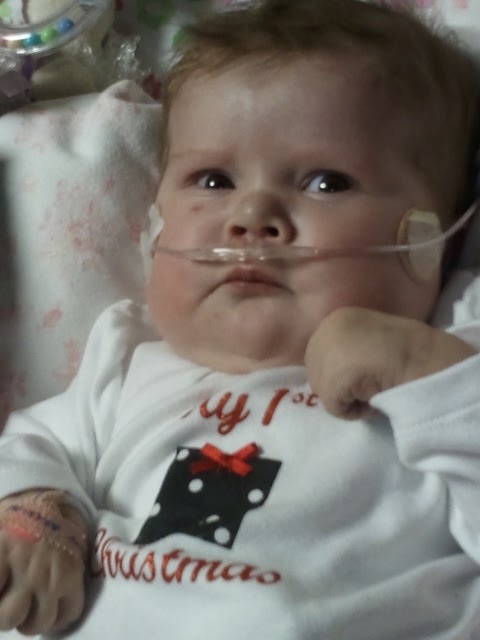 They were NOT pleased… but we all came back to the hospital and spent the evening with Annabelle. We watched a movie, and sang Christmas Carols. Not how I had envisioned the night, but that was okay. My family was TOGETHER! We also let the kiddos open presents that someone from our church had gotten them. It was SUCH a blessing to have them as it took a little of the sting out of a very bad day for my kiddos. The hardest part was still to come though. We drove home that night and when we pulled into the driveway, there were all of our welcome home Annabelle signs and balloons. Scott parked and we both just sobbed. Our kids thought we were crazy, I’m sure. 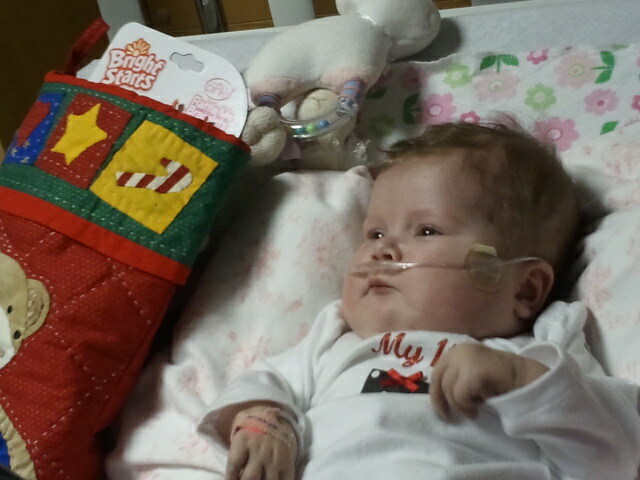 I cried some more when I got inside and saw her swing sitting there, and her stocking on the mantle. All the while though, we hoped to maybe bring her home the next day. I called the hospital on Christmas morning at 7:30 to see how her night had been. She’d had a fever at 4 a.m. of 100.6… and it was up to 103 at 7 even after giving Tylenol. We wouldn’t be taking our Annabelle home on Christmas. We made it through Christmas okay though. We had Christmas morning at home, letting the kiddos open their presents there so we didn’t disrupt their “traditions” any more than we had to. We went to my sisters for our family Christmas dinner, exchanged gifts, played a mean game of Euchre (ugh, I lost by one point… a sore spot!) 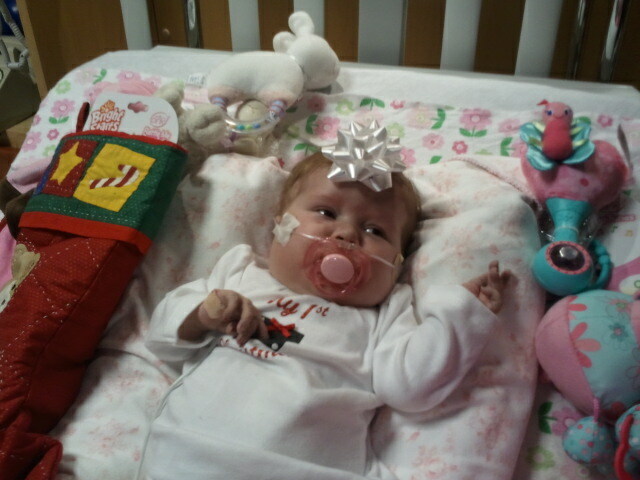 then drove to the hospital to have Christmas with Annabelle. We opened more presents… Annabelle opened all of hers (with a little help from Mommy and sisters) and curtosy of donations from the hospital and a co-worker at my work, the other three had more presents to open too! It, again, took the sting out of what was a little bittersweet. I have cried a LOT in the last two days. Christmas is NOT about family. We say it is sometimes… and mean well… but really, it is about Jesus. It’s about celebrating His birth. Nuff said. Family, presents, trees, decorations, all of that is WONDERFUL and GREAT and I’m not knocking any of it. But those should just be means to getting around to the real reason, not the reasons themselves. Also… Life is not perfect. God never said it would. I have this lovely saying that I’ve held onto for a few years, and it has never been more appropriate than right now. CRAP HAPPENS. But I will praise God even through the crap. There. Words of wisdom from Krista in the last 15 minutes of Christmas Day. I look at the last two days, and I could sit here and be bitter and angry at God for not answering my prayer. I could lament to him about letting us get our hopes up about Annabelle coming home. I could curse Him about life not being fair. Or I can smile and remember my kids giggles, or the way Annabelle looked at us like we were crazy when we piled presents on her crib. I can laugh at our reenactment of Noah’s Ark in Annabelle’s room on Christmas Eve. I can roll my eyes as I remember trying to counter-offer with the doctor about when Annabelle could come home (I really should have been in real-estate…) I can have my heart squeeze at the thought of so many who took time and money to help our kids have an extra special Christmas. I am thankful for so MANY things tonight… And looking at my Annabelle, resting peacefully next to her baby stocking… I know that God is mighty and powerful and I KNOW that He loves us. Because God is still Good. Every day. No matter what. Once again… I hand my Annabelle back into his strong, very capable hands. I’d really do much better if I stopped taking her back all the time! **note** I realize I don’t have any pictures of my other kiddos on here. My apologies. I only have my phone with me and the pics that I took on there at the moment! I'm so sorry it didn't work out the way "we" all planned. And it sounds like quite an eventful Christmas. I keep on praying Annabelle will be home soon! Sounds like you had a blessed Christmas. Sorry Annabelle couldn't come home, yet. Will be praying that changes soon and that you will all be together at home. Blessings for 2011! I'm so sorry you didn't get to take her home for Christmas. I am glad though that your family was together even if it was in her hospital room. I like your saying and will use it when I need it. Krista, your post is beautifully touching and so beautifully centered on Jesus. Thank you for sharing. My prayers are with sweet little Annabelle and your family! Krista, You are so right about Christmas only being about Jesus…not family, not presents, not any of that. It has been really hard for me this year, because it seems like I have heard more people talk about those who don't have anything, who have a hard time this time of year, who don't have joy…but really, Christmas isn't about our personal contentment, it is about that little baby who was born to save us from our sins PERIOD Why do we feel like we are entitled to perfect well cushioned Christmas memories? It sounds to me, that although your memories weren't what you expected, they will stay with you forever and one day you will treasure them so…because even though it was difficult to get through them, your final focus still remained on the baby in the manger. Very selfless, I think! Okay, I am preaching to the choir, but my heart goes out to you and your family…and I will keep praying for baby Annabelle!! Krista, this is a beautiful post about a less than beautiful situation. I'm so sorry things ended up the way they ended. Krista, I'm reading this, sniffling and blinking back tears. Jesus knows, loves, and cares. And, really, the bathroom flooding – you couldn't have made that up. I love how cute and pudgy Annabelle has gotten! 🙂 Baby rolls are the cutest! God bless you and your family. Every one. Krista, your faith amazes me. You are rapidly becoming one of my "heroes." Oh my goodness. Y'all remain in my prayers. And Annabelle grows more beautiful every day. You are one strong, beautiful woman of faith. I admire you so much. Your faith shines through even in the midst of disappointment and hardship. I'm still praying! Krista I am sorry you didn't get to take Annabelle home on Christmas. I almost cried for you reading your post, but God knows best, and He is good all of the time. I thank Him for the blessings he has given you. Praying for your sweet baby to get better. Oh, I'm so sorry things didn't work out the way you wanted. We'll continue to pray for Annabelle. God bless you, Krista. He has given you a powerful witness. I pray that you will have your family together, at home, soon. Oh, Krista, I have tears in my eyes for you. How disappointing for all of you; however, I believe your focus is where it needs to be. We will continue to pray for you, Annabelle and the rest of your family.